I’m a longtime customer of Amazon—everything from books, eBooks, and two Kindles to tennis balls and baseball caps—but I’m looking for an alternative. I’m not unhappy with Amazon’s service, but with its politics. Amazon is waging an aggressive campaign to prevent revenue-starved California from collecting sales taxes from the company’s customers. And that’s only its most recent effort to prevent states from levying sales taxes on online purchases. States have always had the right to charge taxes on the purchases its citizens have made, whether at retail stories or by mail order or online. But, in 1992, the Supreme Court, citing the disparities among state taxes, ruled in Quill Corp. v. North Dakota that, if a company does not have a “nexus” in a state, it does not have to collect sales taxes on purchases that a state’s citizens make from it. It applied at the time to mail-order companies like L.L. Bean, but, by the late ’90s, the ruling was giving online retailers without any offices or stores in a state a decided price advantage over local retailers, or over online companies like Target or Barnes & Noble that had stores around the country. It was also jeopardizing the budgets of the 45 states that depend on sales taxes for about one-third of their revenue. The states, desperate for cash during the current slump, have tried to get around the Quill ruling. In 2008, New York passed a law requiring that, if an out-of-state company had “affiliates” in the state, it would have to collect sales taxes. An “affiliate” could be an online site that received a commission from the out-of-state company when someone used a link on its site to make a purchase from the company. Amazon has thousands of such online affiliates. Subsequently, Illinois, Rhode Island, and North Carolina passed similar measures. 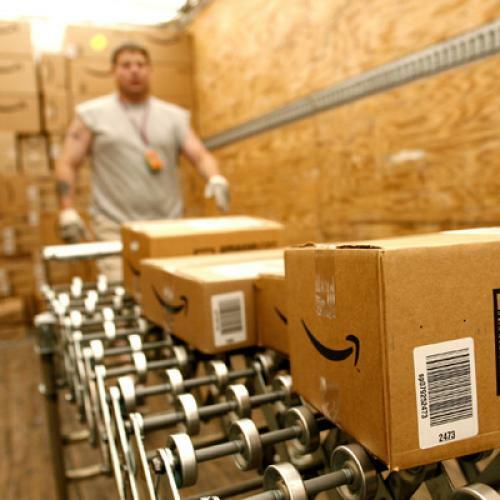 Amazon filed suit against New York and pulled its affiliates from the other states. California, however, is likely to be the biggest battle yet. Last month, the state legislature finally passed a budget that included a provision to tax out-of-state companies that have either an “affiliate” or a “subsidiary” in the state. (In addition to affiliates, Amazon also has a “subsidiary” in Silicon Valley that designs the Kindle.) This time, Amazon outdid itself. The company’s spokeswoman told The New York Times that “the legislation is counterproductive and will not cause our retail business to collect sales tax for the state.” (Writing in the Financial Times, Christopher Caldwell commented that “the duty to obey tax laws does not hinge on one’s opinion of their productivity or constitutionality.”) And Amazon is preparing a referendum for next year’s ballot that will allow it to escape state taxes. There are, of course, reasons to believe that Amazon could keep its business and collect sales taxes. Its prices would still be competitive, and what it can offer that local stores cannot is the convenience of having your purchases delivered to you without having to leave your house. It also has a vigorous business in eBooks and online movies and music. But the question of revenue aside, there is also a good reason to protect local stores from unfair competition. Local realtors sustain neighborhoods and suburban malls; they fund local newspapers and theater groups. They are part of a community in a way that Amazon or Overstock—its Utah-based partner in fighting state sales taxes—will never be. In the Quill ruling, the Court invited Congress to pass legislation that would establish uniform conditions under which states could require out-of-state companies to collect sales taxes. In response, the National Governors Association and National Conference of State Legislatures set up a committee to devise a “streamlined sales tax.” Twenty-three states have already signed onto the committee’s plan, and Amazon claims that it would support such a measure. But, as Michael Mazerov of the Center on Budget and Priorities has argued, the company has hedged its support for a streamlined tax in a way that actually amounts to opposition. And, if the proposal reaches Congress, Amazon can count on support from a Republican Party that follows the anti-tax dictate of Grover Norquist’s Americans for Tax Reform, which has fought internet taxes for over a decade and is already campaigning against the California provision. So the battle does come down to the states—and to the California referendum next year. Here’s hoping that Amazon comes out on the losing end. Technology, New York, Amazon, John Judis, California, Barnes & Noble, North Dakota, Supreme Court, Quill Corp.